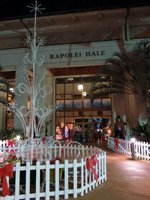 Every December, Kapolei City Lights Bring Holiday Cheer to West Oahu. 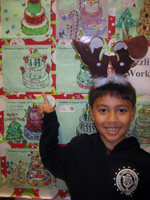 Kapolei City Lights: an Up-and-Coming Holiday Tradition! Of course non-residents are welcome at this free holiday attraction too. But if you’re on Hawaii vacation in December, I’d want you to see the best! As a result, I’d probably have to tell you to skip the Kapolei City Lights holiday celebration and go directly to the Honolulu City Lights… with one exception. If you’re staying in one of the Ko Olina Resort properties (Marriott Ihilani or Disney Aulani), the Kapolei event is a whole lot closer and easier to access. Thus, for anybody who doesn’t want to make the drive into downtown Honolulu, this is a fine festive alternative – though, if you’re willing to fight traffic, I’d still send you to Honolulu where they have more of everything. Nevertheless, Kapolei City Lights still has some of the light displays and some of the larger-than-life holiday scenes that you see in Honolulu. You can still see the themed Christmas tree displays and cheerful holiday décor inside. But this event is at its heart primarily for the local community. 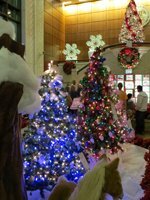 As a result, the single largest exhibit decking this satellite city hall is a display featuring hundreds of holiday coloring contest entries from the local area elementary schools! I doubt this is a huge draw for people who don’t have a West Oahu student in the family, but it’s fun for the parents and children whose artwork was selected. 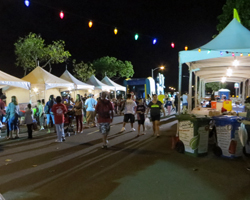 On the second Saturday in December, the City and County of Honolulu and Friends of Kapolei Hale kick-off the holiday merriment at approximately 5pm with a block party on Uluohia Street outside Kapolei Hale. This usually involves live entertainment, kids’ games, food vendors, and a visit from Santa Claus. At approximately 6pm, the West Oahu Public Workers Electric Light Parade runs along Kapolei Parkway from Kinoiki Street to Uluohia Street. Then when the parade is over, they light up a 50-foot (15 m) Cook Island Pine tree outside Kapolei Hale. Festivities usually end by approximately 10pm. There are Christmas parades throughout Oahu (opens a new window/tab); and this one’s very similar… high school marching bands and City service vehicles decorated with holiday lights and themes. If you miss this one, you can always catch another. Parking is wherever you can find it along the Kapolei side streets. Some local businesses open their lots for the event, but most reserve their parking for customers only. This presents a minor challenge on opening night, but the other nights shouldn’t be a problem because they don’t draw anywhere near the kinds of crowds you’d encounter in Honolulu. Ironically, whereas I almost never go to the Honolulu City Lights opening night (due to the crowds), I think I’ve gone to the Kapolei City Lights opening night every year since at least 2006. (It may not be the biggest, but it’s still fun, and it’s my community). If you’re in the area, drop on by and see why Mele Kalikimaka (Merry Christmas) is the thing to say anywhere you get to enjoy our warm and bright Hawaiian Christmas days!